Living in a flood zone is risky not just for your home, but can also impact your life. A flood can damage your home and property, and it will almost surely impact you financially. Dealing with the stress of a flood also puts an intense emotional and potentially physical strain on you as the owner. There are many factors that can cause flooding. Some of these factors can be controlled, such as ensuring you have proper drainage systems that are free from debris. Other factors are uncontrollable – severe rain fall, snow melt, hurricane force weather, and more. Flooding can be a serious problem, especially if your insurance policy doesn’t provide flood coverage. Most insurance policies do not include this coverage by default. One of the most common factors that a require a homeowner to purchase a flood protection insurance is the location of their home – specifically, is the home located in a flood plain. 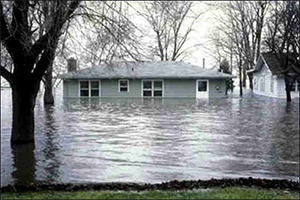 Flood insurance can be purchased even if a property is not in a flood zone. Flood insurance ratess vary according to the level of risk. The higher the risk, the higher the rates climb. When considering a home purchase, check to see if the home will fall in a flood zone. Visit msc.fema.gov or www.freeflood.net to check if the property is in a flood zone. FEMA has developed flood zone maps based on elevation and likelyhood of flooding in an area. The assessor’s office can also provide information on if a property falls in to a flood zone. If the property is in a flood zone, the lender will likely require flood insurance. The need for flood instance should always be confirmed with a homeowner’s insurance agent. Take steps to be prepared when flooding happens. Having flood insurance, even in a low risk area, may save you a lot of headaches in the future.